18th Century Irish Portrait Artist. Biography, Paintings. 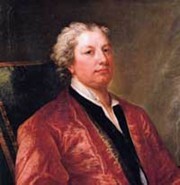 One of the great Irish portrait artists, Charles Jervas was born in Dublin around 1675. Moving to London, he studied under the established portraitist Sir Godfrey Kneller for two years between 1694 and 1695. Jervas was also an art-collector, and after selling a series of prints of Cartoons by the Renaissance Old Master Raphael to Dr. George Clarke of All Souls College, Oxford, he used the proceeds to travel to Paris and Rome, remaining abroad until about 1709 when he returned to London. Falling on his feet, Charles Jervas rapidly built up a reputation as a portrait artist, executing portraits of rich London intellectuals and friends, including Jonathan Swift and the poet Alexander Pope (both of which now hang in the National Portrait Gallery, London). His fame as a popular artist was referred to in the works of literary figures of the period, including those of Pope himself. 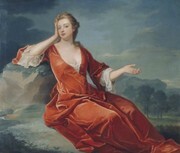 In 1723, having successfully established himself, Jervas succeeded Sir Godfrey Kneller in the post of Principal Portrait Painter to King George I, and continued to reside in London until his death in 1739. Seen as a rather mediocre artist by his contemporaries, Charles Jervas had sufficient luck and personality to prosper, much to the chagrin of his rivals. According to one account, when hearing that Jervas had set up a carriage with four horses, the portraitist Sir Godfrey Kneller replied: "I hope his horses draw better than he does, otherwise he'll never get to his destination." See also: English Figurative Painting 18th/19th Century.  For details of other portraitists, see: Irish Artists: Paintings and Biographies.  For more about portraitists like Charles Jervas, see: Irish Art Guide.